RPSC 1st Grade 2nd Grade Teacher and patwar Bihar Forest Guard Railway JE exam exam related Study Material Date Wise 18-03-2019 Haryana SSC (HSSC) 2019 Turner Instructor, Electrician Instructor & Other vacancies Craft Instructor, Draughtsman, Instructor & Various Vacancy food inspector Junior Engineer (Electrical) GK Important Notes daily update KVS Kendriya Vidyalaya Sangathan Notes Subject wise PSTET CTET 2019, TGT, PGT, B.Ed HTET Jammu Kashmir TET, UPTET Maharashtra TET Chhattisgarh teacher Vacancies Study Lecturer CG TET. Question(1).According to the National Forest Policy, 1988, on how many areas of the total geographical area of the state is there forest cover for environmental balance? राष्ट्रीय वन नीति, 1988 के अनुसार पर्यावरण सन्तुलन हेतु राज्य के कुल भौगोलिक क्षेत्रफल के कितने भू-भाग पर वनों का होना अनिवार्य है? Question(2). Where is Central Center for Research Center is located? केन्द्रीय मरू अनुसंधान केन्द्र स्थित है? 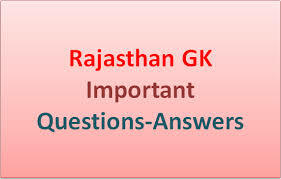 Question(3).What is the purpose of putting Arjuna tree in Rajasthan? राजस्थान में अर्जुन वृक्ष लगाने का उद्देश्य है? Question(4). Rajasthan is a part of the total forest area of the country? राजस्थान में देश के कुल वन क्षेत्र का भाग है? Question(5). Rajasthan has a place in the country in terms of forest area? राजस्थान का वन क्षेत्र की दृष्टि से देश में स्थान है? Question(6). The partnership between the Center and the State Government is respectively in the Marine Plantation Program? मरू वृक्षारोपण कार्यक्रम में केन्द्र व राज्य सरकार की भागीदारी क्रमशः है? Question(7).The tree known as ‘Gaurav of Rajasthan’? ‘राजस्थान का गौरव’ नाम से जाना जाने वाला वृक्ष है? Question(8). Which is the year of social forestry planning? सामाजिक वानिकी योजना के प्रारंभ होने का वर्ष है? Question(9). Which of the following trees is known as ‘Shami’ in Indian scriptures? निम्न में से किस वृक्ष को भारतीय धर्म ग्रंथों में ‘शमी’ के नाम से जाना जाता है? Question(10). The fodder leaves are called in the local language?खेजड़ी की पत्तियों के चारे को स्थानीय भाषा में कहते हैं? Study Material Subject wise Bihar forest guard study material Bihar Police Forest Guard Previous Papers with Answers 1st Grade, 2nd grade, 3rd grade REET, Teacher, B.Ed, RSMSSB, Up police GK, Bihar police GK, Delhi Haryana police, Rajasthan Police, patwari, LDC, HTET, JK TET, Jammu Kashmir TET J&K Teachers Test Indian History GK study material Notes, PSTET Punjab TET Haryana TET HTET UPTET, bihar tet, Uttarakhand TET UTET study material Notes.